I was so totally consumed from the start with this story that I did not notice a glob of ketchup falling in my lap. I was reading while eating lunch, which I do often, but never have I dropped food on me and not noticed. I think had the table next to me not starting laughing I wouldn't have noticed until I walked out of the restaurant. I sure hope they weren't laughing at me - it was a big glob of ketchup though. I had been hearing about the books from Candlemark & Gleam from a twitter chat I participate in. The books would be mentioned, but not titles. I knew they published books that were a little off from mainstream, but I was intrigued. I also thought it was odd that they never approached me to review. I started talking to Kate via email and finally convince her that I really wanted to try some of their books. She was right about them not really be the kind of books I would have picked out for myself (well at least Broken as I haven't read the other one yet). 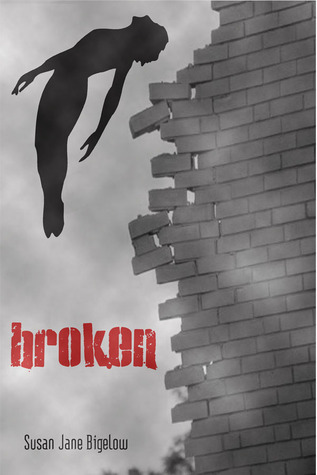 Broken is about superheros (kind of like the television show Heros). The setting is post-apocalpytic type society in the US. I've read a few other books set during this time. I think I enjoy this time period the best for my sci-fi/fantasy/speculative fiction type novels. I think Broken is the first book I've read that has the ruling government in Australia though. Like I said this story really captivated my attention and had me attention totally consumed. I had to know what happened and couldn't turn the pages fast enough. I had a little chuckle every time they mentioned Sky Ranger's cape. I kept hearing Edna from the Incredibles saying "NO CAPES!" (if you don't know what I'm talking about here is a clip on Youtube). I wonder if there will be more books about these heros. At times, it seemed that the author was attempting to make a social statement, but never fully did. If there are more books planned then I could see that it was just a primer to the issues that will be taken on in the continuing story. Otherwise, it felt like the author wanted to comment on a social issue, but didn't really want to take a stand or fully explore the implications. One of the reasons I like reading books set post-apocalyptic is because of the ability to ask what ifs and the discussion that can come out of exploring the impact of our own moral and societal decisions. Outside of that complaint, I really enjoyed the book. It was not something I normally would have chosen for myself, but that's why I love reviewing books - I definitely have expanded my reading horizons since I started this blog. So if you are thinking from the description that the story maybe a little too off the deep end for your realistic reading taste, take the leap. It's summer, try something different. You might just like it; I did. Your Turn: This is my first time reading a book about superheros (at least as an adult). Are superheros just for kid books or do you like them in your adult reading, too?